Click the button to the right to send us a message. Updates for the Whispering Knights woodland project - Neolithic Echoes. Once again the woodland will be open to visitors for Oxfordshire Artweeks 2018. See directions for the Whispering Knights - Neolithic Echoes project. Some pictures of the Neolithic Echoes structures in an atmospheric mist. Some quite serious snow in the Cotswold woods this winter. Some of the structures (older ones) got a bit squashed and needed repair whilst others stood up pretty well. Oxfordshire Artweeks runs from Saturday May 6th until Monday May 29th 2017. We've been getting lots of questions. Many thanks to the anonymous couple who came into the woods to look and ask what is going on and showed so much enthusiasm for the Neolithic Echoes project. Even luckier, I had been trying to film some of the work and had forgotten that the camera was still running - it was perched up on a step-ladder on a tripod looking down, so it is amazing that it managed to capture the conversation at a distance. We could not have scripted this so perfectly if we had tried. 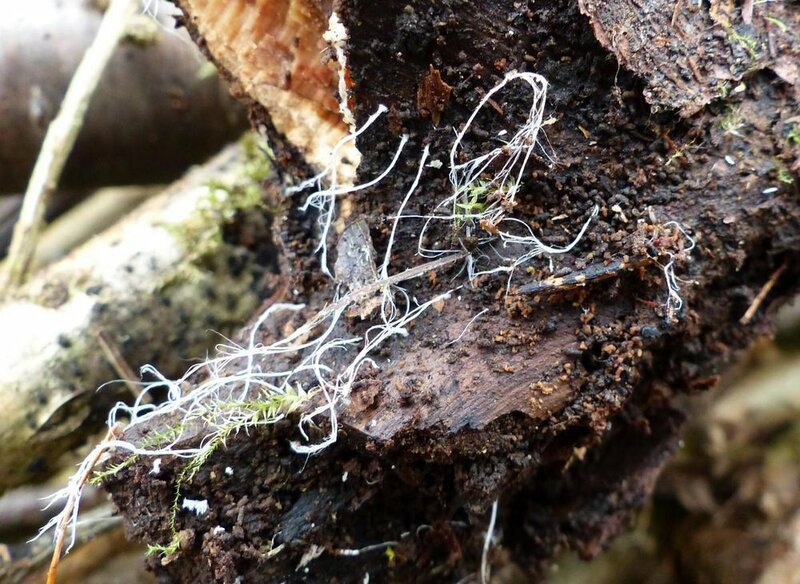 We've been busy working in the woods - here are some things we discovered in late winter. The brash mounds in the woods are doing what we hoped they would do – becoming habitats and shelters... mini ecosystems. Being both sturdy and loosely woven, the mounds are accessible by many creatures. Ground beetles are finding the lower layers where we lay the larger pieces of wood and insects are inhabiting the upper layers which are made up of lighter materials. Because birds and small mammals can also get in there, they are finding these insects too, which means that the mounds are acting like larders. In a way, they are dead hedges within the woodland and are utilised in much the same way as live hedges – the birds flit from one to another, using them as protective cover as they make their way through the trees. As we walk through the wood, we see them all around us, flying in and out of the woven brash or perching atop to sing their territory songs. 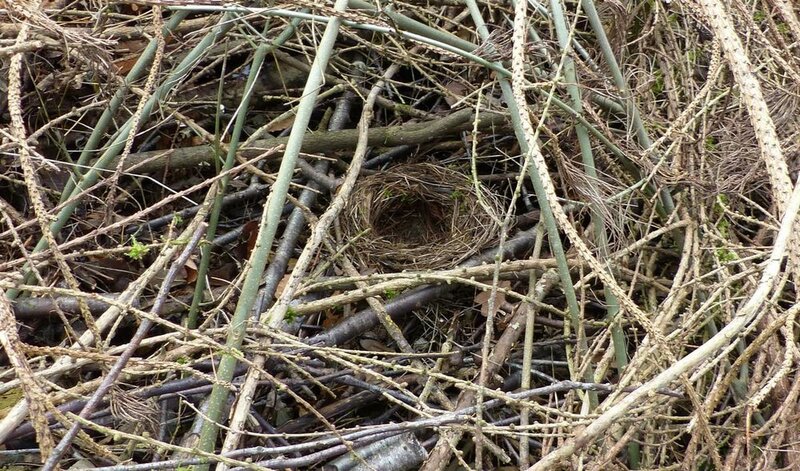 Birds have started to nest in the brash – the fields in the area are large and there isn't a lot of hedgerow, so it's a welcome sign that they are finding the shelter and relative safety of the brash to make nests in. In the building of new mounds, we are now combining older ones. We've found this to be good use of materials and space – the wood is but 12 acres and there are only so many smaller mounds that easily fit into it. The place was getting pretty crowded. The new tactic is to build long – circles, spirals and mounds that curve in serpentine fashion through the trees, creating considerable lengths of wind break and shelter. Where old mounds are taken apart, we see the development of fungi – many species are springing up. Some are surprisingly beautiful, like the tiny, delicate pink mushroom (Mycena adonis) and the rich purple velvet of this crust fungus (Terana caerulea) growing on dead wood within a mound. Through it all run threads of fungal mycelium, the building blocks of a healthy ecosystems and a pleasure to see in this developing community of species. We only heard right before Christmas that our Whispering Knights - Neolithic Echoes project had been selected to be included in the 'Art Inspired by the Cotswolds' exhibition at the Corinium Museum in Cirencester. As well as a selection of large framed photos, Karl has edited a new video intro for the exhibition. Admission is free and the exhibition runs from January 15th to February 5th 2017. Celebrating the 50th anniversary of the Cotswolds Area of Outstanding Beauty (Cotswolds AONB). Throughout the year, the Cotswolds Conservation Board will be organising celebration events to mark the occasion and to encourage everyone to protect, enhance and conserve this beautiful landscape. With the end of autumn 2016 upon us we are beginning work on existing and new structures for the Whispering Knights - Neolithic Echoes project. Once the core is built up, the next stage is to 'dress' it... how that turns out will depend on the materials we have from the ongoing thinning that needs to take place to give the remaining trees space and light. Delightful images of ephemeral flowering bodies. From Saturday May 21st until Monday May 30th 2016, the woodland project we’ve been working on will be open to the public for Oxfordshire Artweeks. Karl has put together a 3 minute video of the more elaborate structures. Everything is so ephemeral that things look their best for a short time and then start to decay as insects, mycelium, weather and time work their magic. Each stage has its beauty, but it is the beauty of change and impermanence. Wabi-sabi; perhaps. The woodland will be open for Oxfordshire Artweeks from May 21st until May 30th 2016. Find out more info and directions. Wabi-sabi (侘寂?) represents Japanese aesthetics and a Japanese world view centered on the acceptance of transience and imperfection. The aesthetic is sometimes described as one of beauty that is "imperfect, impermanent, and incomplete". It is a concept derived from the Buddhist teaching of the three marks of existence (三法印 sanbōin? ), specifically impermanence (無常 mujō? ), suffering (苦 ku?) and emptiness or absence of self-nature (空 kū? ).